In early April, a Tajik driver died when an avalanche near the border between Tajikistan and Kyrgyzstan crushed his truck, smashing its contents. The tragic episode highlights the danger of an environmental incident posed by the transport of hazardous materials along the Northern Distribution Network. The network, or NDN, is a key supply route for US and NATO forces fighting in Afghanistan. It can be used to transport a variety of hazardous materials to and from Afghanistan. Although US Military Surface Deployment and Distribution Command (SDDC) has strict guidelines for how these items can be shipped, fears remain that an accident on either the Uzbek rail route, or the Kazakh-Kyrgyz-Tajik (KKT) road route could have significant environmental consequences. It turns out that the truck caught in the deadly avalanche on April 6 was carrying just machine parts. But according to an SDCC customer advisory issued on March 31, more than 60 items classified as hazardous materials (hazmat) are approved for transit along Russian and Uzbek railroads, or the KKT. These items include corrosives such as nitric acid; a variety of industrial alcohols; flammable derivatives of petroleum; methylenedianiline, a suspected carcinogen; and caesium which can spontaneously ignite when exposed to air or cold water. Compounds that could be used as precursors in the production of drugs, such as acetone, or battery acid fluids are banned. However ammonium nitrate, typically used as an agricultural fertilizer, but which can also be used in the making of bombs, is not. Gases known to be harmful to the ozone layer are also banned, or permissions have yet to be determined. But compressed methane is cleared for transit. Methanol and flammable liquids not otherwise specified may be moved through Uzbekistan, if the shipper pays an increased rail tariff. The sea and land branch of the NDN that originates in Turkey is closed to all materials classified as hazardous. 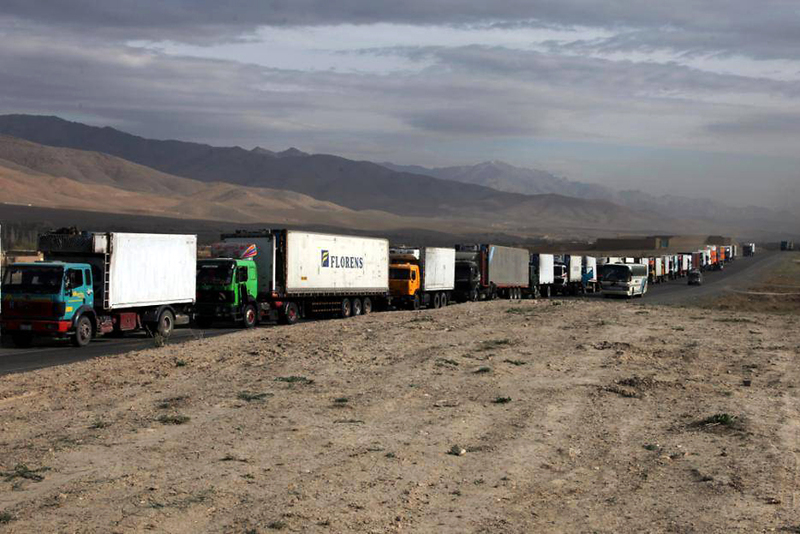 NDN insiders say that while SDDC has made every effort to ensure that health and safety standards are met, the ability of Afghanistan, Kyrgyzstan and Tajikistan to respond to a potential accident involving hazardous materials is extremely limited. “Tajikistan has zero emergency response capabilities, and the Salang tunnel in Afghanistan, which is about 2-kilometers long, is entirely unventilated. Traveling through it is one of the scariest things I have ever experienced,” said a source familiar with NDN operations. “My main concern about a hazmat incident in Tajikistan would be potential proximity to water flowing on into the Ferghana Valley,” he added. A spokesman for SDDC said that it tries to ensure that all local laws are observed, and transit countries are asked to advise the US military on additional risk factors. “We move things in accordance with the laws and/or agreements of a country in/through which we are transporting our goods. Part of that equation is using carriers that are certified to move those commodities in accordance with the law, and have conveyances and operators licensed in compliance with the law,” Mitchell Chandran told Eurasianet.org on April 18. Chandran noted that there have been a “few instances” in which NDN cargo caused damage that required the US government to provide for “clean up and repair of damaged property.” If contracted carriers were to be deemed negligent, US officials would take action to hold the contractors liable, Chandran added.